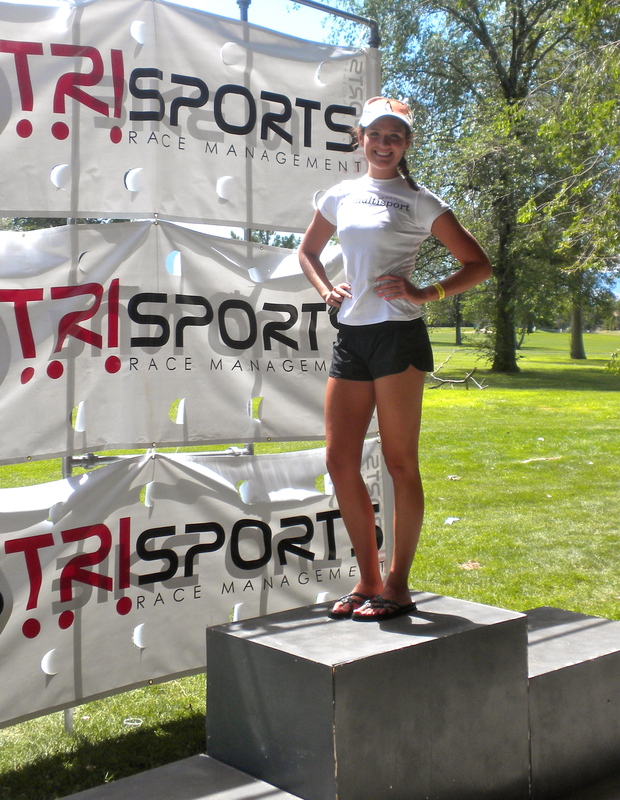 This past weekend I was finally able to do a local triathlon in my home state of Utah. The race was the Stansbury Triathlon out in Stansbury Park, Utah. So I know it’s summer, but I’ll say it anyways. This race was HOT! The Olympic female wave started at 8:20, and that little lake was just barely wetsuit legal. So I squiggled into my seal suit, aherm, I mean wetsuit, and started preparing myself mentally to get a tad bit overheated. The swim was interesting, the longest leg had the buoy directly under the sun so looking for it was impossible, I actually stopped 2-3 times each loop to sight the buoy and then hoped I kept swimming a straight line. Despite all that I was 2nd out of the water and in and out of transition crazy fast! I think motivation was just getting my wetsuit off. I wanted to gain as much time on the bike as possible so I really pushed myself, drawing on all the awesome bike workouts that I have been doing lately. I was first off the bike and had the 3rd fastest female bike split. Another super fast transition and it was out onto the two loop, hot, shadeless, run. I have to give a shout out to the random family that sat out on their front lawn and sprayed the grateful athletes with their hose. Thank you!! Also the girl who ran after me at an aid station to throw water on me because she missed the first time. It helped, but not quite enough. I finished 2nd overall and was edged out of first by ten seconds in the last 40 m. Talk about frustrating. I knew that she was behind me, but I had no idea she was THAT close. Lesson learned though, always have eyes in the back of your head and at the end of a race you give it your all, regardless of who is around you. Even though I was so close to taking first I can’t have any regrets because I know that I raced my hardest given the conditions. After finishing I basically begged anyone near me to help me to a bench, thank goodness Jen Johnson was there to grab me and she reacted so quickly. I was pretty sure that if I fell down, I wasn’t going to get back up anytime soon. All in all it was a pretty great day to be a triathlete. Unfortunately they had issues with the timing and did not give out the Olympic awards after the race, but I decided that 2nd OA and 1st AG still deserved a podium picture! Next race is in 26 days: USAT Age Group Nationals in Burlingon, VT! WTG !!!!! Just love reading your blog and hearing about your progress……you make Gary and me of course so proud….I do keep bragging on you at work…especially since the tour de France as been on the TV in the Doctors’ lounge…..we have die hard race fans in there…..some say they will look for your blog… have to get more fans on team Zara…go girl !!!!!!!!! Zara, I don’t know if I’ll see you this week at any Masters swim workouts, so if not I want to send you best wishes for Vermont and for the coming school year. I’ll be sending positive waves your way.